Someone bought for us J.Co donuts. I used the term “blockbuster.” Blockbuster to me means a long queue of people for a phenomenal movie. In Trinoma, an Ayala mall in Quezon City, a donuts store where donuts are like movies; people line up like that of a blockbuster movie. 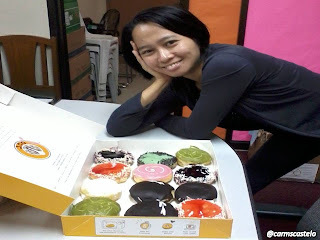 The store is an outlet of J.Co. I did a little of online research. According to Wikipedia, J.CO Donuts & Cofee is a café retailer in Indonesia specializing in donuts, frozen yogurt and coffee. The coffee is owned by and managed by Johnny Andrean Group . It began trading since 2005. I wonder how it costs to have a franchise of it in the Philippines. I'm sure I can't afford to have a franchise of it.